At Crawford Eye Care, we are pleased to offer a wide range of optometry services for our community! Our experienced optometrists can provide you with thorough eye evaluations, determine if you need corrective lenses and your exact prescription strength, fit you with the appropriate specialty eyewear, and help you pick out the most flattering pair of glasses for your face shape and skin tone. 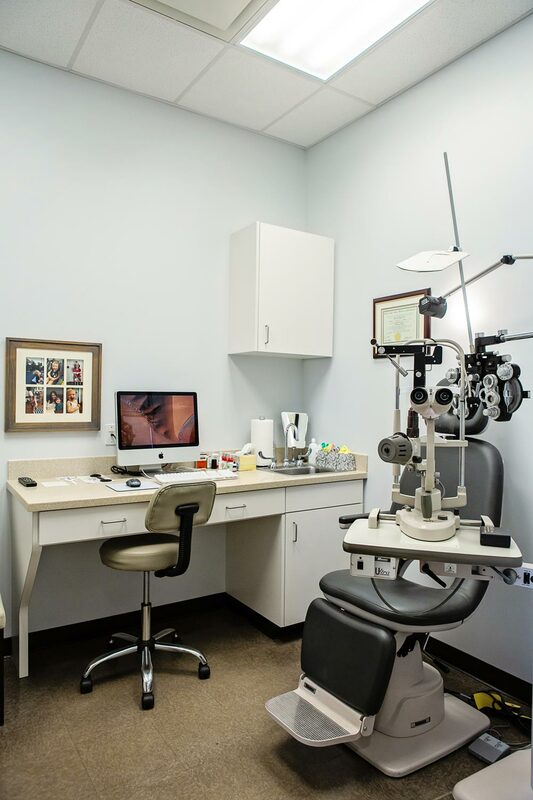 We are committed to using the latest technology and allowing ample time for each examination to ensure your needs are fully understood and the health of your eyes is thoroughly evaluated. We have a digital retinal camera that allows you to see detailed images of your retinas and is a great assett for following changes that may occur in your eyes over time. Our goal is to provide you with recommendations for your eye care and eyewear to maximize your vision to meet your daily needs. Contact lenses have become much more convenient and comfortable over the last few years. We fit a large variety of lenses, including silicone hydrogels(which may be worn continuously for 30 days in some cases), multifocal and monovision contacts(which allow for good distance and near vision without the need for reading glasses in patients over 40), daily disposable contacts (don’t require cleaning-great for people with sensitive eyes, allergy problems, or part-time contact lens wearers), as well as many other options. We love giving patients the freedom of not having to wear their glasses everyday, so just ask if you are interested! All children need to have a thorough eye exam to ensure they are seeing well and to detect potentially sight-threatening conditions such as strabismus (eye-turn) or amblyopia(lazy eye). We recommend that each child be examined before starting kindergarten or sooner if any problems are noticed. Dr. Karmen is a member of the InfantSEE program, which provides a free eye examination to children 12 months or younger. We also carry a large selection of stylish children’s frames to keep your little one looking great! We perform diabetic eye examinations, diagnose and treat glaucoma, provide co-management for cataract and refractive surgeries, and are here to treat any eye injuries or “pink-eye” problems you are having. For diabetic and co-management examinations, we will communicate with your referring doctors to ensure the best care possible.